Apart from the effects of the demolition derby and the painful sight of our dated decoration the main reason for redecorating the hall is to answer that perpetual question "So what are you going to do with that quilt?" I don't actually think I have to do anything with it - process is as good as product and all that. But actually, whilst I have no problem hording cupboards of lap- and -upwards sized quilts and rotating which ones I watch TV under, I am inhibited from making smaller ones because they will never see the light of day. So, the plan is to turn our hall/ stairs/ landing into a gallery where I can rotate my own wall quilts. I could put up fixed poles and make quilts sized to the space. That will work fine on this overhang wall which will take one single large quilt well. I am happy fishing a pole over the bannister onto a fixed cuphook when I want to change that quilt. 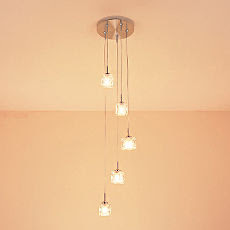 But I feel that that fixed hooks at fixed heights and width would curtail spontaneous creativity for the other walls. Ami Simms has a 'No See um' idea but unless I read it wrongly It still requires a fixed curtain rail although it allows for differing quilt widths. These hangers are attractive and can be moved from quilt to quilt as required but still require nails in the wall which might become visible if I move to a smaller quilts. ( I am wondering if I install a high picture rail and use these over suspended picture hooks that might work?) Or, it seems you can use these removable adhesive strips with them - but that does not solve the problem of how to reach up to fill the space on the tall wall along the stairs. Does anyone have experience of hanging quilts on a pulley system and have any advice for me? I like things to match. In fact I almost have a fettish about things matching and whilst I have come to accept that, given that no producer of anything maintains a line for more than 2 seconds, that is not always possible. But sometimes it is possible. And if it is possible then so it must be. This tired hall is to become light and contemporary and neutral. It will become a little gallery for quilts. (More in the next post on how to hang them). And while we were pickng the hall carpet thought we might as well do the bathroom which has these tiles in and so requires these paint chips to consider. And of course a lightshade is needed. 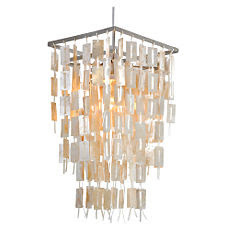 I really, really wanted this one but we can't because it doesn't fit on the ceiling rose which I want to keep. So we got this one instead. And of course I am now contemplating buyng this book! OK, if this is not the funniest blog story you read today ( or indeed this week) I am packing up my laptop and going home. 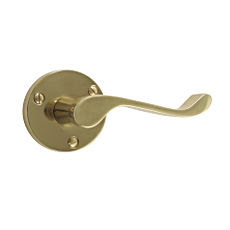 Periodically the handle on our bathroom door ( which we inherited with the house) falls off and needs to be screwed back on. Last week it fell off but this time refused to screw back on. 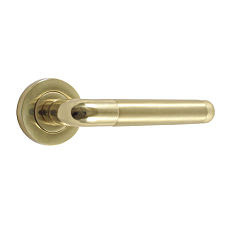 Dennis wanted to go out at once and buy a new handle but I wouldn't let him, because I wanted to choose matching handles for all the doors off the landing, and I wasn't ready to do that until we got the planned decorating done. So, the door has been left slightly ajar with a door wedge in use. Today, Den went to Manchester all day and I had a bath. I got out of the bath and - oh, the door is closed. Must have been the breeze. Only it would not open. The latch was stuck and no amount of tugging, rattling or poking with toothbrush or hairclip would move it. I assessed my options. I stood on the loo, poked my head through the little window and yelled for my neighbour. Nothing. Not suprising since his car was not there. I did have an already read copy of Down Under Quilts in there and the catalogue from the African art museum in Paris. But no food (unless you count strawberry shower gel) and about 8 hours to go. ...with my bare hands ( and a set of bathroom scales as a weapon). I am woman! I took several novels with me to read in Bath but managed to acquire more books than I took! I have been after this one for ages but prices on the net range from £46-£94 a copy. Imagine my delight when I found it at Country Threads for £17.99 I think they still have a copy if you want to get it. Basically this book is all about how its OK to quilt they way I like to already - cut it up sew it together, no pattern. Fun! A while ago I found this on a friends shelf but again could not get a decent priced copy on line. Again - Country Threads came up trumps. This, found at the delightful Mr B's Emporium of Reading was a present from my equally delightful husband. It is mostly about ceramics but I coveted it because of the information in it about how their designs were inspired. Having bought these journals ( two sizes, four colours - couldn't decide!) I decided it would be money well spent to learn what to do with them. Waterstones yielded this. and I shall blog later about the consequences. The Thursday before Easter I left Dennis at the station to start an ill-fated journey to the Royal Opera House. ( Short version - first two trains cancelled, he got there by following a circuitous route recommended by a fellow traveller, opera apparently great, return train travelled at 20 pmh then turned into a bus via Swindon half way through the journey. He gotto Bath station at 3am and had to walk home in a torrential downpour.) Right by the station I found an antiquarian book shop I had passed many times without realising that in the basement is an ordinary second hand bookshop .... which yielded this out of print book from a series I have been collecting. and this because, um, well it was there. Then, looking for a nice notebook I had once seen in the Oxfam stationery section, I stumbled on this for just £4. No notebook but hey, does it look to you like I'm going to have time to write in one anyway?! Some people are just plain nice. We don't get post on a Sunday so I was surprised this morning when Dennis handed me a fat parcel. It had been with a neighbour since its delivery yesterday. It turned out to be from Kristen in Germany. 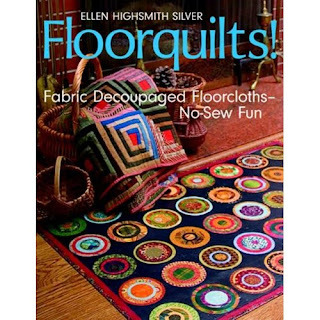 A while ago I asked in a general email to my twelveby12 colleagues as to whether anyone had a spare copy of Quilters Home magazine becuase I had never seen a copy here. as I say.. plain nice. Dennis, for reasons known only to him wants to call this Marvelous Malcolm Macaw but its not called that at all - its called Polly in the Rain. And no, Dennis is not getting his second vote either which is to call the Polly Esther. It is 23 x 32 and is the scraps from the scrap quilt from the log cabin quilt. (And still there are scraps left.....). I think you can just tell on the photo that I have been at it with crayons on the tail, beak and head. How do you think I should quilt it? I am toying with either wobbly lines vertically down the strips and leaves (albeit in blue thread) to emphasise the rainforest feel in the border... Or then I thought the quilting on the strips maybe should be diagonal and maybe even big stitches by hand to show a more literal rain. But I am open to your ideas. PS Ten minutes after posting. I've just thought - rain in the rainforest comes down vertically doesn't it? Then as the bus speeded up down Queens Drive I saw at the end, the BBC1 logo. Rickaaaaay as in the Eastenders soap opera way that the returning character Bianca used to yell at her husband Ricky Butcher. PS. Me, quilts obsessed?! Surely not. PPS Is Eastenders exported? I haven't watched it for years but isn't interesting how much information you can pick up about a soap without ever seeing it? So, I took a day off, unpaid, to do some training sitting with a Judge today. The idea was to get a whole load of experience in dealing with detailed assessments. In lay terms that's lawyers arguing about how much the losing party should pay the winner in costs after the main case has finished. When that is over the lawyers then argue about how much the costs of arguing about the costs should be. And, if an offer on costs had been made and not beaten how much the interest on the costs of arguing about costs should be. It may not surprise you that this is not an area of practice I chose to have much to do with until I started being a Judge myself. Anyway, I got to court to find that all the lawyers had had a fit of agreeing costs (and costs of costs) and only one tiny thing went ahead. This was just sufficient to confirm to me that I was doing it right already and probably was panicking when I took a day off to learn if I was doing it right. So, I ended up at home early. With time to finish the quilt top made from my log cabin scraps. This exhibition was on at the Victoria Gallery when I was in Bath. Three artists - Candice Bahouth, Carol Waller and Kaffe Fassett exhibited works inspired by a dresser of blue and white china. ( although I strongly suspect some was made beforehand!). The link above shows you lots of the work on show. ( Photography was not allowed) . and here is some fabric acquired specifically to create the quilts now in my head and inspired by this exhibition. I'll show you whenever I get chance to actually make them! Today was the Trentham Gardens Quilt show. I had three quilts in just to participate so that a show would actually exist. The most recently made was Rositha's world. Imagine my surprise - this quilt scored 74/80 in the Judging! And yes, I cried when I opened the comment letter. I lost marks on the quilting design and quilting workmanship which is absolutely fair because the quilting plan was, 'Right, its under the needle, now how shall I scribble on it?' It was done in about 5 hours at Midsomer Quilting who lent me a room when I was on holiday and I was unable to maintain stitch regularity at the end because I was aching so much. I got 8/10 for each of those two categories which has determined that my next few months have to be spent practising quilting!! The other quilts I showed were this one, 'She is more precious than rubies' made for my parent's anniversary. and 'White women can quilt', made with the scraps. "Thats too clever for me, that one." Woman 1: Look at the fabrics. Why do you think she chose to put silk there?" Woman 2 : For the effect of the texture. (Runs finger very close to it) See how it reflects the light and the crinkled look contrasts with the smooth of the cotton. Ok, I'll go with that. In fact, it is cheap polyester and its in there because I was having a very very bad day at work in Macclesfield once, had had no sleep, needed both cheering up and keeping awake so went for a fresh air walk to a fabric shop where there was no cotton so I bought that and stuck it in that evening as quilting therapy needing only to sew and not caring about quality! I know this is getting a long post but for those who have always wondered how Judges decide ( as indeed I did until I found out when collecting my quilts tonight that you get a comments sheet) and in the interests only of helping others know how to do well in a quilt show ( because until today I didn't know any of this) I set out below a list of the criteria and the marks given for each quilt (White, then Rubies then Rositha) . I hope this is not breaching any rule of ettiquette! A handwritten comment on Rubies was ..."A charming quit with pleasing colour scheme. Do try to keep your applique stitches small and tuck under the raw edges. A good try!" Which is absolutely fair as the applique was mostly done in semi-darkness on a swaying train up and down to London and the stitches are less than fine. I was pleased to see I had improved by the time of the last quilt. I was a little confused to get 6 for regularity of the stitches on Rubies as it was done with a longarm stitch regulator! It is clear that this category also included the wobbliness of the shape of the freehand feathers I over ambitiously attempted on my first longarm using attempt. Finally this is the quilt - by Lesley Brankin- that won the special Water category that Rositha's world was in. (Incidentally it was a different Judge for this category than for the other two quilts. This is the one, by Anja Townrow I would have voted winner but in fact it did not get a place at all. I found the comments fair and useful to know what to focus my learning on and it was very fun to watch people looking at them. I hope they shed some light on the process for others. I'd encourage everyone to show somthing, somewhere, sometime. Not least because I love looking at other people's quilts whatever they are like. And finally ( phew!) I might not have won a prize but I was stopped 4 times to have a photo of my applique coat taken by passers by. That will do me nicely thank you. And now, if I could only get my head through the door, I would go and start another. Last week, De Pickford of MQ kindly allowed me to camp in her shop for a day when it was not officially open to quilt Rositha's world ready to send to the Trentham Gardens show. While I was there a fabric and books rep was there and I got to be privy to the process of choosing fabric for the shop. I thought observing De's techniques might be of assistance with that thorny question of what fabric and how much to buy when stash building. She sought opinions of her staff. ( And me as well) Translate: shop with a friend. In my experience of show shopping with my buddy Lesley this works extremely well as she observes me gravitating to my natural greens and browns and sticks firmly and persuasively to her prior instructions from me to make me buy brights. Then she lets me have the autumn tones as well. Finally, De got to the stage of choosing how much to buy. I paid good attention here. I always have the same dilema. If I buy FQs I can have soooo many pretty prints. If I get half meters I'll probably find it a more useful length but will have to put some back to stay with in budget. But borders and backing need really big pieces. So do I spend by budget on several meters of just one or two fabrics? I watched carefully and now all is clear. .......I need to increase my budget and buy about eighty bolts in a go. Aha. Easy when you know how. My friend at Midsomer Quilting, Chris, deserved a little present which for privacy reasons I shall not specify here. Lets just say it was appropriate that it was heart related. I decided to be arty since he has been such a supporter of our twelveby12 endeavour. I used my newly learned photoprinting technology and pitcure editing sofware to produce a montage of old biological drawings of the heart and framed it, added a red heart with surgeons stitches and..... um, no not sure about that all of a sudden. Dennis assured me it was - as I had aimed for - masculine, not funereal as I now feared. Now, its not that I don't trust him but you can never have too many opinions so I asked a couple of pals. Brenda was diplomatic. It was 'confronting', maybe I should go for somthing cheerier! Lesley just told it as it was - it reminded her of a TV programme aboyt autopsies. Right. Chris loved it. And also loved the fact that others in the twelveby12 group had responded to my call to send him unexplained heart postcards. He desribed himself as 'gobsmacked'. Our theme in that group at the moment is community and he said that he really felt that he was part of a community even though he has not ( yet) met most of us. Now isn't that one of the best things about quilting? PS Anyone have need of a funereal mini-quilt?